As the haze that occur in the nation worsen throughout the week, the day for the second round of Malaysia MiniGP Members Series 2015 were looking to be held under a mild haze condition and it was certainly going to be a tough condition for all the competing riders to race in. 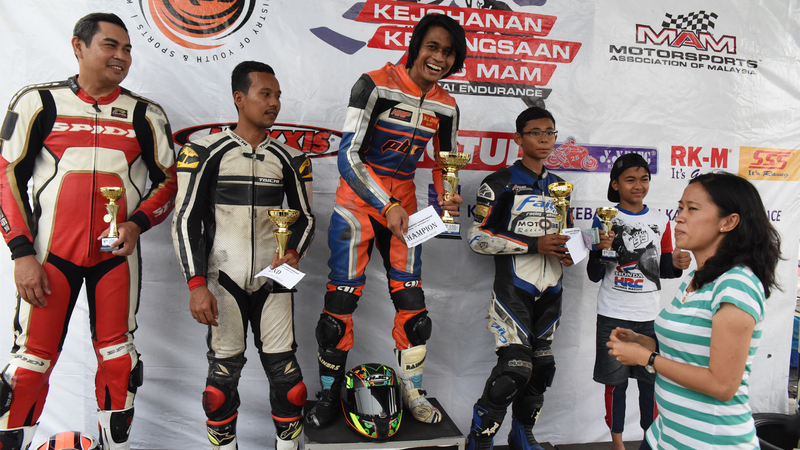 A total of 19 riders came to compete for the glory in round two of the Malaysia MiniGP Members Series 2015 and it was Reffy Kamar of PB2R Racing Team that came away as the winner of the Open class category to lead away with 68 points in the overall championship standing. The size of the grid for the open class battle was not as big as the novice class but every single team had prepared their machine to the very best in order to get themselves to the top. 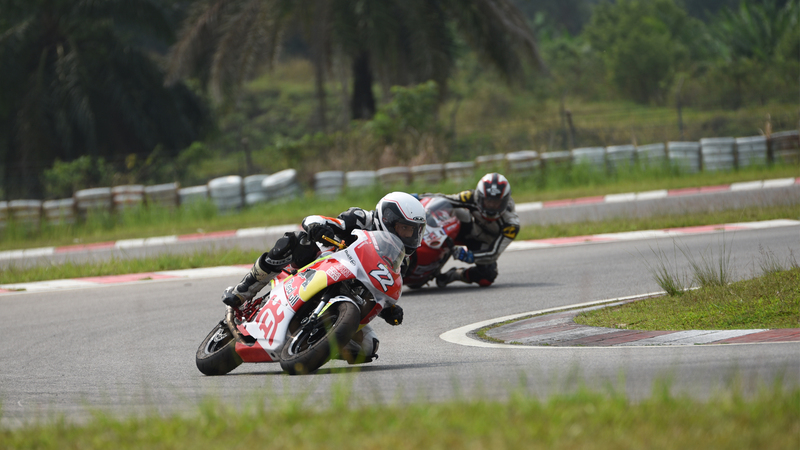 PB2R Racing Team, Pitrides Motorsports Team and the late inclusion of Sani Adnan as the privateer of the open class category saw a total of 6 riders set to battle out each other. As the day progresses, it was clear that it will be a very close match between the top riders of the open class category; but it was Reffy Kamar who came away with the win after a dramatic turnaround following his team mate late crash in the race. After clocking a best time of 1:02.636s during qualifying, Reffy found himself starting on the first row of the grid behind his young team mate Izam Ikmal who will be starting from pole position after dominating the session with a best time of 1:01.643s. Completing the first row was Pitrides Motorsports Team Jailani Kosman who was consistent with his pace throughout the qualifying session after a disastrous practice in the morning. The race started normally at 3.25PM for 15 laps under the scorching heat of the sun and mild haze which makes the track temperature a little bit higher than the session before. Reffy made a very good start to go in front immediately but it was clear that the PB2R’s young prodigy rider; Izam, was determined to get his first win in the series after taking over the leading group in less than a lap over his veteran master. There was battle all over the grid which gives a great entertainment to the spectators and the PB2R’s duo was totally dominating the race with their pace. Unfortunate turn of event at the closing stage of the race shows two of the young riders both from Pitrides Motorsports and PB2R going out with a mechanical problem for Daniel Aqim after a great battle with Reffy and Jailani while Izam who were totally dominating the race crashes out in the very last lap of the race. 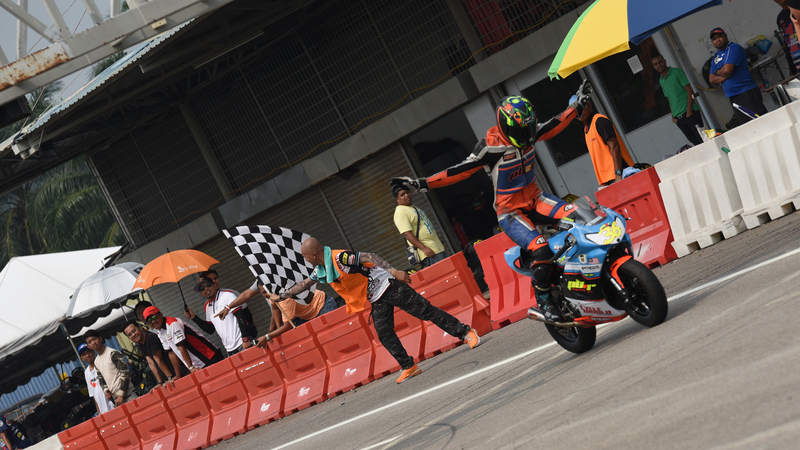 Reffy Kamar makes the best of the situation by grabbing his second win of the Malaysia MiniGP Members Series to lead the overall championship standing. Having a good consistent pace throughout the day was really the key for Reffy’s success and it still shows that he is the man to beat for this year’s championship. As of now, Reffy is clear off his closest contenders in the overall standing and it will be interesting to see what will happen in the third round of the series which supposed to be on the 3rd of October as a support race to the KBS Kapcai Endurance 2015.